LinkedIn might seem like it’s only for office workers, but this is no longer the case. Nowadays, every industry—including manufacturing—is on LinkedIn. There’s a large number of recruiters looking to fill technical positions on the platform, too. In fact, over 90% of recruiters will scan your LinkedIn profile as part of the recruitment process. 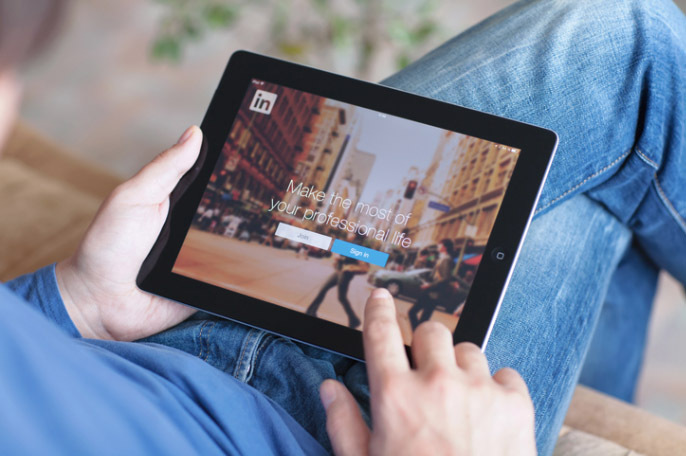 If you’re not on Linkedin already, it’s time to get started. Below are six tips on what electronic technicians and other professionals should include on their LinkedIn profile to land an interview. When recruiters are looking for talent, they would enter certain keywords, such as “Electronics Technician” into LinkedIn’s search engine to find people who fit their criteria. It’s essential to include relevant keyword in the headline field so you can rank for that keyword. This technique is called Search Engine Optimization (SEO). And don’t forget to include your location and industry, as this is also highly relevant information to search engines. According to LinkedIn, the top industries for Electronic Technicians are Electrical & Electronic Manufacturing, Information Technology & Services, and Oil & energy. As well, be sure not to have too much information. After all, this is only a summary. Nobody wants to read a 2,000 word summary that’s one big block of text. Keep it short and break it up with lots of white space and bullet points. If you need more inspiration, have a look at job postings on LinkedIn, Glassdoor, and Indeed to see what kinds of skills and keywords employers are looking for. Your profile picture can reveal a lot about you and your attributes. So be sure to pick a professional picture that can help you make a good online first impression. Not only should you list out your top skills in your profile, you also want to obtain Endorsements on them to help improve your searchability. Reach out to your networks for Endorsements. Sometimes it helps by endorsing other people first to obtain a favour. Although your headline, image, and summary are the first things that someone viewing your profile will read, it’s also important to improve your work experience section. Your work experience section should start with an overview, with two or three sentences explaining what your job entails. Include facts and figures and use actions words such as “responsible for…” or “duties included.” Highlights your achievements and check for spelling and grammar. You also want to make sure you link your job to the company, which will show your current or previous company’s logo on your profile. The same applies to your education section. 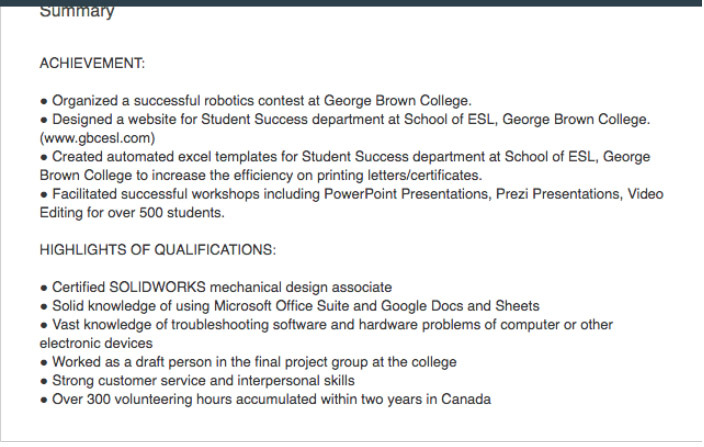 For instance, be sure to add your Electronic Technician Certificate program completion with George Brown College to give yourself more credentials. You can always see what works for other people to get inspiration. Simply conduct a quick search on LinkedIn to see which profiles are cropping up on your search results page. Ask yourself, what do these profiles have in common? What keywords am I missing? Take what you observe and use it on your own. Blend a few ideas from the best profiles out there. 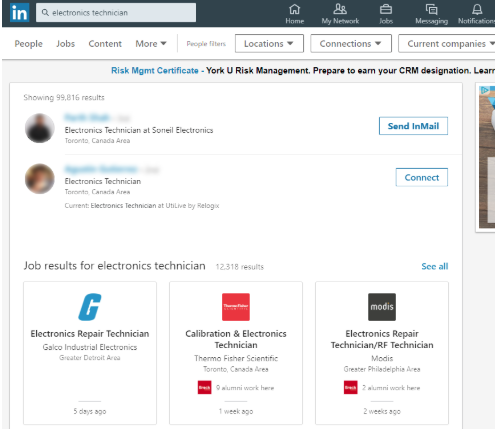 If you are looking for an electronics technician or other technical job, Linkedin is a great place to be. Check our career prospects page to learn more about what kind of industries are looking for candidates.